At Moore’s Mill Eyecare we know that thorough, comprehensive patient care that is also patient friendly, is both reassuring and empowering. 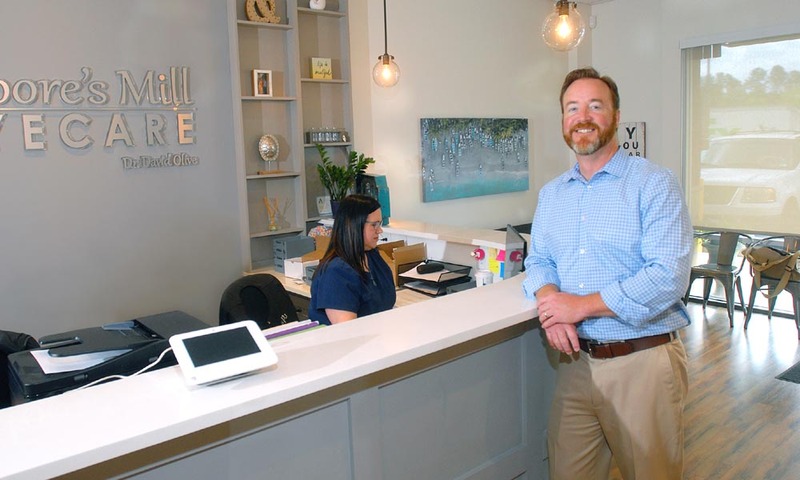 For over 15 years, Dr. David Olive has been serving Auburn, Opelika, and the surrounding areas with the exceptional patient care he has become known for, and is pleased to now offer the same level of care and attention to the entire eyecare experience through his private practice, Moore’s Mill Eyecare. Opened in 2014, Moore’s Mill Eyecare utilizes the latest, state of the art equipment to diagnose, monitor, and treat your eye-related conditions. The OPD III Wavefront Aberrometer completes 20 diagnostic metrics in seconds, including keratometry and corneal topography. The Optos Daytona Retinal Imaging System provides a much wider view of the retina than traditional means, facilitating evaluation of retinal health for conditions such as glaucoma, retinal detachments, macular degeneration and other conditions such as diabetes and high blood pressure. Under the direction of our licensed, certified optician, our optical studio offers a selection of more than 350 frames in various styles and price points. We understand how difficult it can be to find the perfect pair of glasses, and believe that a great frame should feel and look like it was made for you. A great frame should also highlight the uniqueness of your face and personality. We truly enjoy taking the time with you to thoughtfully find just that exact pair. Moore’s Mill Eyecare~ complete individual-focused eyecare experience that everyone deserves. Thank you to our current and future patients and customers who entrust us with their care. We look forward to continuing to serve you! Contact us to schedule your appointment or call (334)521-7944. Dr. Olive has been my eye doctor for several years. He is the very best in my opinion. His staff is extremely helpful and great at their jobs. I highly recommend Moore's Mill Eyecare! I always have great, comfortable visits at Moores Mill EyeCare. They are very thorough and quick with their appointments. The service is very friendly and reliable. The check ups are very easy and up to date. Recommend to anyone in the Lee County area! Great customer service , which is sometimes lacking today. Very knowledgeable Doctor with up-to-date technology for your eye exam, and a great selection of frames and contacts. Worked great with our vision insurance.